On October 16, credit unions can turn their debit and credit cards into Miracle Makers! 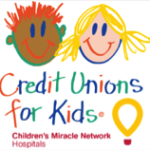 Shop for Miracles is the newest Credit Unions for Kids’ national campaign. This one-day fundraiser takes place on October 16 as an exciting and innovative way to celebrate the World Council of Credit Union’s International Credit Union Day® at your credit union! The concept is simple: each time members use their credit union issued debit and/or credit card your credit union will donate $0.25 (or other designated amount) on International Credit Union Day to your local CMN Hospital. 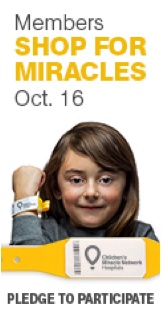 Visit www.CU4Kids.org/ShopforMiracles to learn more and pledge to participate! The TruStage Auto & Home Insurance Program—helping members protect what matters most, while providing proven, predictable and immediate impact for your credit union. Learn more at www.cunamutual.com/auto or contact your CUNA Mutual Group representative. Over 50 members strong the Young Professionals initiative aims to strengthen and engage young credit union professionals through a wide variety of networking opportunities, educational seminars and community events. Each of the events is designed to prepare YPCU members with skills that are needed in the industry. Matt Hill, Director of Financial Services at Creighton Federal Credit Union currently heads up the Leagues Young Professional group. Here is a little more on Matt. CUNA Mutual Group’s fifth annual, day-long Discovery Conference scheduled for October 15, offers 13 credit union-focused sessions from the convenience of your desk – and it’s free. The Discovery Conference is the Web-based equivalent of a face-to-face conference without the associated expenses or time away from the office. This year’s agenda features valuable and timely information on the most important topics and trends in the industry. Over the years, credit unions have become the experts when it comes to providing the best possible service. In many cases, this is what has enabled them to survive. However, in today’s highly competitive environment, if credit unions are to remain viable for the long-term, they must also incorporate strategies that boost profitability and enable them to maintain the resources necessary to provide members with the services they want and need, both now and in the future. An important savings program that the Nebraska Credit Union League strongly advocated for was recently featured on the front page of the New York Times Sunday edition. The article notes the many benefits of prize-linked savings accounts, and it highlights several individuals who have won—and saved—through the lottery style programs. Finding a payment processor that does much more than just enable business members to accept all major credit cards is something Credit Unions should consider before initiating the strategic partnership. For example, not all processors are equipped to provide additional revenue enhancing services like PowerPay. This means numerous Credit Unions and their clients benefit from exceptional payment processing and more. By now we are all aware of the Letter to Credit Unions sent in January by the NCUA, which stated that credit unions would be assessed civil money penalties if they did not meet the call report filing deadlines. The first quarter filing deadline has come and gone, and as a result of late filing, 62 credit unions were subject to civil money penalties. These penalties are no joke – the late filers will pay a total of $57,750 in penalties, with individual penalties ranging from $150 to $20,000. This has served as a wake-up call to file on time – however, some credit unions are still struggling with the time and expense it takes to complete their call reports. Lincoln Community Foundation gives $25,000 grant to Community Development Resources. The Lincoln Community Foundation has awarded a grant of $25,000 to Community Development Resources for operating capital for the proposed Community Hope Federal Credit Union. Former Rep. Jim Nussle, a nine-term congressman who also served as the director of the White House Office of Management and Budget, is the new president and CEO of CUNA. Nussle will assume his new role in Washington, D.C., in the coming weeks. “After an exhaustive search, in which nearly 100 highly qualified candidates were considered, the CUNA board has unanimously accepted and certified the executive search committee’s recommendation of Jim as the next chief executive of our association,” said CUNA Chairman Dennis Pierce. Enterprise Car Sales is located at 7505 “L” Street in Ralston. We have been a proud partner with credit unions across the country for more than 30 years. We have been focusing our time and energy on fostering those relationships and helping local credit unions increase their used auto loan volume. We have found that through a direct partnership, the credit union, the member, and Enterprise all find success. Do you struggle to find the perfect balance between increasing revenue, bringing in new membership, and making current members happy? If you do, you are not alone – the vast majority of credit unions see this as a pain point as well. 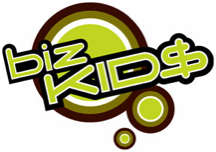 So you might have seen Biz Kid$ on TV or read about it in an industry publication and wondered how does it relate to credit unions and why should you care? 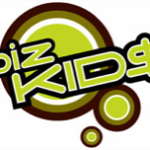 In short: it’s a great credit union funded public television series that you can leverage to teach kids how to make and manage money. 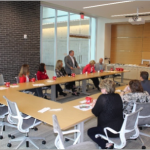 The Nebraska Credit Union League created a coffee club for Nebraska credit union advocates to discuss, ponder, and get active in the legislative, political, and regulatory arenas. The Club is named after Claude Orchard, a Nebraskan, who was a founding father of the national association of credit unions which would later become the Credit Union National Association (CUNA). 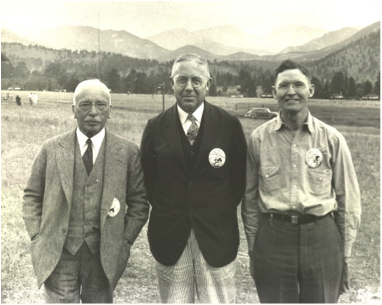 It was Claude who proposed that credit union delegates from each state meet in Estes Park, Colorado for the creation of the national association’s bylaws. Claude was Nebraska’s delegate at that historic event in August of 1934. 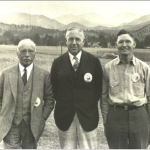 Claude organized credit union branches for the Armour Meat-Packing Company.He also headed the Federal Credit Union Supervision division under the Farm Credit Administration for 19 years. 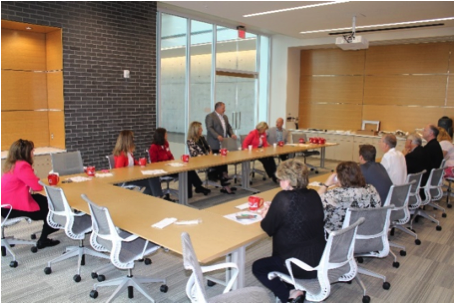 Club meetings were held in Omaha at SAC Federal Credit Union and in Lincoln at Peoples Choice Federal Credit Union. “The Club is an opportunity for our credit union staffs and volunteers to not only network but to be insiders in the political, legislative and regulatory arenas,” said Brandon Luetkenhaus, Governmental & Public Affairs Director of the Nebraska Credit Union League. 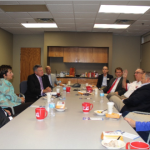 The Club is an informal meeting that seeks to not only keep members abreast of current issues at the local, state and federal levels but also to introduce them to credit union supported candidates running for political office. “It’s a great way for us to introduce candidates to our advocates but also gives them opportunities to get involved in these key political races,” said Luetkenhaus. Members join with an annual $100 contribution to NCULLAC, the state credit union PAC. 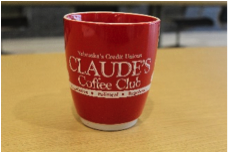 3 attended the Omaha Claude’s Coffee Club (CCC). She spoke about her campaign, her position on several issues, and expressed her gratitude for the support she’s received from Nebraska credit unions. At the Lincoln CCC, State Legislative candidate Patty Pansing Brooks outlined her position on several key issues and expressed her gratitude for the financial support that Nebraska’s credit unions were providing to her campaign. Immediately following the Lincoln CCC, several members met with Adam Morfeld who is running for the State Legislature in District 46. 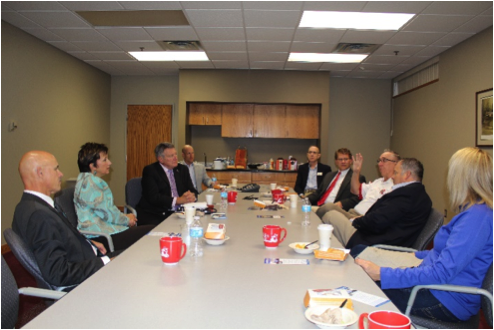 In addition to meeting local candidates, CCC members discussed the NCUA’s RBC proposed rule, regulatory relief bills in Congress, the 2015 Nebraska legislative session, and the 2014 election cycle. 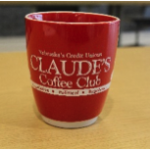 Each CCC member received a Club coffee mug and lapel pin. The next CCC meetings are planned for the first week in November. All credit union staff and volunteers are invited to join the Club. For information on joining or if you have questions, please contact Brandon Luetkenhaus at 402-333-9331 x. 202.